The Obama administration has reportedly apologized to Iran for an incident in which the Iranian Revolutionary Guard Corps (IRGC) seized two U.S. Navy boats, taking 10 sailors captive. The event happened hours before President Barack Obama’s final State of the Union address on Tuesday. Neither the president nor Gov. Nikki Haley (R-SC), who delivered the official Republican response, mentioned the crisis. Less than 24 hours later, the IRGC stated that they had released the 10 sailors. CNN reported that a U.S. source had confirmed that the released crew members are now on board the USS Anzio, receiving initial medical checks. After the boats were seized, the U.S. pursued the IRGC by sea and air before relenting. Iran interrogated the sailors, searching both boats and demanding an apology. The incident occurred just days after Iran launched a rocket within 1,500 yards of the USS Harry Truman Carrier in the Persian Gulf. The captured riverine boats were from San Diego and part of the Coastal Riverine Group 1. 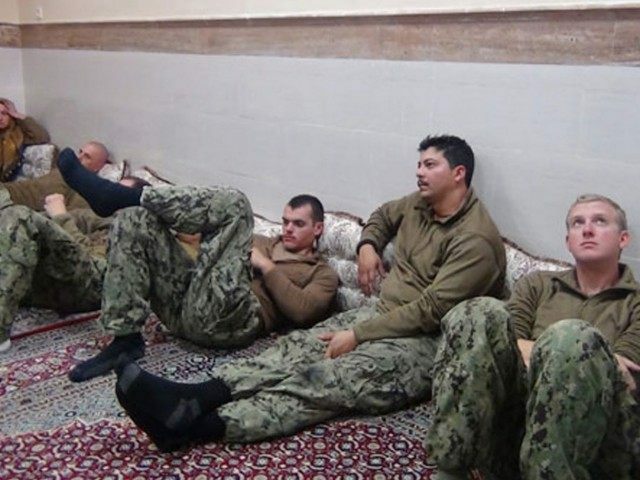 Contrary to the White House’s claims, a U.S. official reportedly told CNN’s Pentagon Correspondent Barbara Starr that the IRGC’s confiscation of the sailors’ GPS and communications equipment was, indeed, “hostile”. Perhaps even more telling was the mainstream media‘s reluctance to address Obama’s effort to ignore the sudden crisis with Iran. Obama did not however, forgo the opportunity to gloat about the deal with Iran, which is just days away from implementation. Like the president, Gov. Nikki Haley of South Carolina, who was selected to deliver the GOP rebuttal to President Obama’s speech, also failed to utter a single word about the hostage incident in the Persian Gulf, and instead chose to attack the policies of Republican presidential frontrunner Donald Trump. Ramezan Sharif, a Revolutionary Guard spokesman, had initially dismissed reports about the release as “media speculation” that could not be confirmed. According to VOA News, he said the IRGC would take “necessary measures” if it was determined the sailors were in Iranian waters to gather intelligence. The BBC broke news that General Ali Fadavi, the commander of IRGC’s navy said the U.S. apologized to Iran for entering Iranian waters. However, there has not yet been any confirmation from Washington that Secretary of State John Kerry issued an apology. #IRGC Navy commander: After holding #US Navy sailors, US warship & helicopters had some unprofessional behavior which lasted for 40 minutes. Iran has become more assertive in the Persian Gulf as well as in the Strait of Hormuz, as it seeks to advance their geopolitical dominance throughout the Middle East. In 2007, Iran held 15 British sailors and Marines hostage for 13 days after they were captured in a disputed area between Iran and Iraq. A similar incident took place in 2009, but the hostages were released several days later.